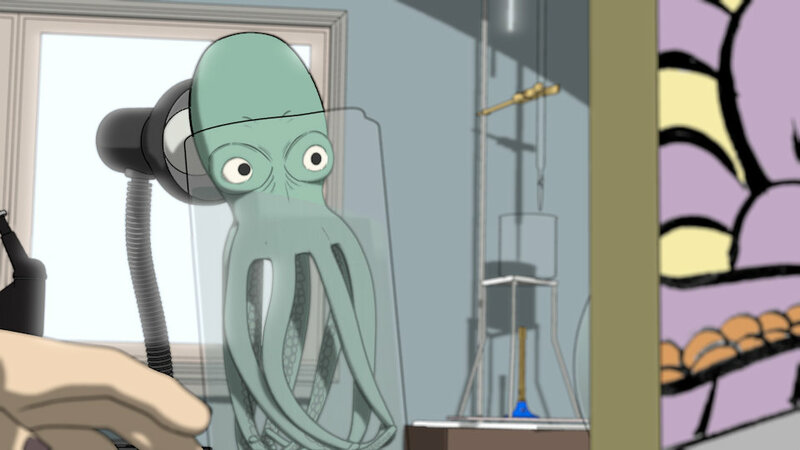 A scientist defends his home from a zombie octopus with nothing but a broom and a pair of kitchen gloves. What's not to love? From script to screen: the job was to bring to life (no pun intended) Joseph Tarling's bonkers-in-a-good-way zombie science epic. He provided the dialogue, audio and overall story, I provided everything else. It was interesting to go back to NPR rendering with Blender's Freestyle, last used in 2011's The Light At The End. In trying to emulate it's comic book origins, lighting was kept fairly simple, with textures and subtle compositing effects providing most of the visual interest. Details such as facial markings were hand-painted onto the 3D models, which gave a clean but appealing style when combined with edge lines around all geometry. I also made use of the Blender "Edge Nodes" technique by Daniel Kreuter, Light BWK and Lee Posey. Thanks guys! Produced an entire 3-minute animated short: screenplay, storyboards, all 3D assets, animation and rendering.